@mondobrew (AKA Lee Odom) sent me this tweet last night during the St. Louis Rams / Seattle Seahawks game: @BigGame81 This #SEAvLA has to be a catch 22 for you. 3 #STATE guys starting on #SEA and your beloved #RAMS. Hey @mondobrew, you think that was bad? 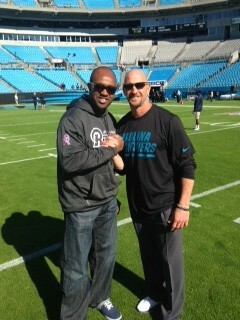 Last week I was on the sidelines with the Rams at the Rams vs. Panthers game in Charlotte. Talk about divided loyalties. Everyone who knows me knows that I spent my formative years in St. Louis – 10 years in all. And I love the Rams for everything the team did for me and the fans gave me. I became a St. Louis Cardinals fan and a St. Louis Blues fan. Right now, I’m rooting big time for the Cards in the World Series. But you also know that North Carolina is my home. I root for the Panthers, the Bobcats and the Hurricanes. I was born here and I returned here to live after retiring from the NFL. Last week in Charlotte was crazy. I had dinner the night before the game with Dré Bly (a former UNC rival turned Rams teammate turned friend … talk about loyalties), Leroy Glover, the Rams player development coordinator, and Cal Eversgerd, the Rams alumni coordinator. We told stories and had a great time. The next morning, I had breakfast with the Rams wide receivers. I rode the team bus to Panther’s Stadium. When I got on the field, I went to see my former teammate Ricky Proehl, who was part of the greatest show on turf. Guess what? He now coaches the wide receivers for the Panthers. And to top it off, my son’s Pop Warner team played a mini-game inside the stadium as part of the warm up to the NFL game. It was all going on. Yup, it was an emotional roller coaster. But here’s the deal. When the whistle blows, I get my game face on and it’s all Rams. I think Russell Wilson is a great quarterback and I’ll root for him and want to see him do well. But not against the Rams. That goes for every NC State player. It also goes for the Panthers. But not without some tugs at the heart strings.